**~ A POCKET FULL OF ROSES~**: HAPPY PINK SATURDAY !!! A Happy Pink Saturday to you my friend!! That is such a beautiful birdcage! WOW!!! Your pink post is stunning, love the birdcage. Oh my sweetness you always have the best Pink Saturday posts! Birdcage is TDF, love it all. Happy Pink Saturday to you Mari! Lovely pink post today..thanks for visiting! Have a great weekend..
Love your bird cage full of gorgeous flowers and a cute bird. SUCH BEAUTIFUL THINGS YOU HAVE SHARED. I LOVE THE PICTURE FRAME. IT IS SO VERY BEAUTIFUL AND THE ROSES ARE LOOK REAL. YOU HAVE VERY TALENTED FRIENDS. Hello sweet M...can't wait to see more. 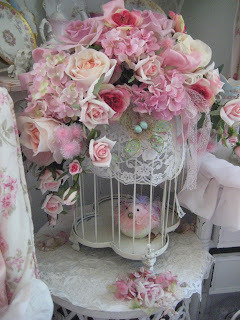 This birdcage is soo darling and that frame...I would SOOOOO have it in my house! Those ARE some of the most handmade roses I've seen. Happy Pink Saturday! Oh My, it was hard to leave your Pink Saturday page today....what lovely handmade roses...the pinks are DEVINE! Your frame is dazzling and your bird cage just scrumptious! I have been looking for a small one, (I am running out of room)to decorate just for me! I love all your gorgeous treasures. You sure do PINK proud my dear friend. 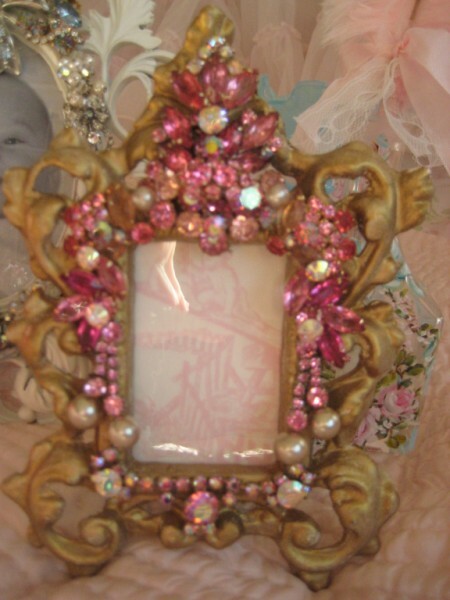 The handmade roses are stunning, I adore pretty frames like your beauty and the bird cage is over the top wonderful. Enjoy the weekend and thank you for stopping by sweetness and your kind comments. Hello and a very happy Pink Saturday to you!! That frame is so lovely! I just adore your items. These are so very pretty! You are truly blessed to have such generous friends!! What pink eyecandy they create! Gorgeous pretty confections!!! Thank you so much for your kind comments at my blog! If your pillow didnt arrive saturday then its monday for sure! I got the order right away but it didnt dawn on me that it was you because the name was your sweet hubby :-) I hope you are pleased with it! Wishes for a glorious Sunday to you and your family!! I am in love with your frame, heck, I'm in love with it all. I'm going to have to check out those gals. Thanks for coming over for a visit and leaving such a nice comment. I've been trying to catch up on visiting everyone. I am taken back by your praise.. I am so happy you enjoyed viewing Garden of Angels.. I really enjoyed painting this one. Thank you so much! That are lovely and sweet pinks for this Pink Saturday . Hello Mari, Still making my Pink Saturday visits! THank you so much for stopping by and leaving a sweet comment. Love your pinks this week. That bird cage is stunning! Your pink post is stunning, love the birdcage.